The Wisdom Of Father Brown is a collection of twelve stories starring the priest Father Brown, and his friend Inspector Flambeau. 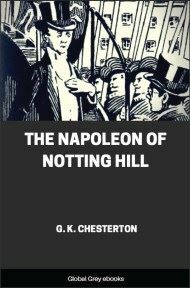 Stories include; The Absence Of Mr Glass; The Paradise Of Thieves; The Duel Of Dr Hirsch; The Man In The Passage; The Mistake Of The Machine; The Head Of Caesar; The Purple Wig; The Perishing Of The Pendragons; The God Of The Gongs; The Salad Of Colonel Cray; The Strange Crime Of John Boulnois; and, The Fairy Tale Of Father Brown. 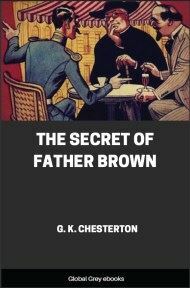 Unlike the more famous fictional detective Sherlock Holmes, Father Brown's methods tend to be intuitive rather than deductive. Dr Hood paced the length of his string of apartments, bounded—as the boys' geographies say—on the east by the North Sea and on the west by the serried ranks of his sociological and criminologist library. He was clad in an artist's velvet, but with none of an artist's negligence; his hair was heavily shot with grey, but growing thick and healthy; his face was lean, but sanguine and expectant. Everything about him and his room indicated something at once rigid and restless, like that great northern sea by which (on pure principles of hygiene) he had built his home. 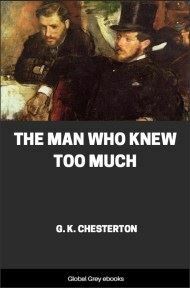 "I hardly understand you," replied the scientist, with a cold intensity of manner. "I fear you have mistaken the chambers. I am Dr Hood, and my work is almost entirely literary and educational. 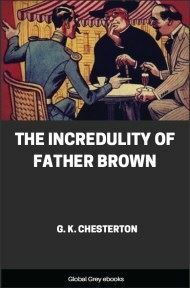 It is true that I have sometimes been consulted by the police in cases of peculiar difficulty and importance, but—"
"Oh, this is of the greatest importance," broke in the little man called Brown. "Why, her mother won't let them get engaged." And he leaned back in his chair in radiant rationality. The brows of Dr Hood were drawn down darkly, but the eyes under them were bright with something that might be anger or might be amusement. "And still," he said, "I do not quite understand." The great Orion Hood's scientific triumphs had deprived him of many things—some said of his health, others of his God; but they had not wholly despoiled him of his sense of the absurd. At the last plea of the ingenuous priest a chuckle broke out of him from inside, and he threw himself into an arm-chair in an ironical attitude of the consulting physician. "Mr Brown," he said gravely, "it is quite fourteen and a half years since I was personally asked to test a personal problem: then it was the case of an attempt to poison the French President at a Lord Mayor's Banquet. It is now, I understand, a question of whether some friend of yours called Maggie is a suitable fiancee for some friend of hers called Todhunter. Well, Mr Brown, I am a sportsman. I will take it on. I will give the MacNab family my best advice, as good as I gave the French Republic and the King of England—no, better: fourteen years better. I have nothing else to do this afternoon. Tell me your story."